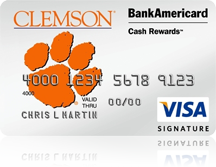 Keep your school spirit alive by giving Clemson University a place of pride in your wallet with a Clemson Alumni Association Visa Platinum credit card issued by Bank of America. 0% APR on the first two months purchases for the first 12 billing cycles following the opening of your account. 0% APR on balance transfers (3% fee applies) for the first 12 billing cycles following the opening of your account. The Clemson Alumni Association is a vibrant community dedicated to helping former students enhance their life’s journey by keeping in contact with classmates, instructors and support staff. An open-membership, nonprofit organization since its inception in 1896, the Clemson Alumni Association exists to connect you with your fellow Tigers and with your alma mater. Check out the recent changes to the Alumni Association’s look and feel. To keep you in-the-know on the latest news from campus and up-to-date on all of the important alumni events, check out the latest issue of The Echo eNewsletter. Finally, follow all things Clemson through the Clemson World online magazine.